Spring officially began at 5:58 PM EDT yesterday, and for many of us across the country, it can’t come soon enough. Although the weather may not yet feel like spring (portions of the Northeast US may see accumulating snow within the next few days! ), we can definitely notice a difference in the sun. Did you know that the sun angle we see now is the same sun angle we see in mid-October? We are also seeing the days lengthen by about 3 minutes per day in upstate New York (the exact time differs slightly from place to place). There are other markers of spring, as well: animals are coming out of hibernation, buds are appearing on the trees (and allergies are ramping up! ), and eventually we will see blooms of all types appear. While we still have about 7 weeks to go in upstate New York until our average last frost, gardeners and farmers will be starting early crops such as lettuce and peas just as soon as the ground is soft enough to dig. Did you know that just like weather observers, there are volunteer observers who keep track of all of the markers of seasonal changes each year as well? The USA National Phenology Network was established in 2007 to “collect, store and share phenology data and information”. Spring leaf index anomaly. Courtesy USANPN. As you can see, spring blooms are similarly ahead of schedule in the southeast, and behind schedule in the Plains and the desert Southwest. These graphics are created using statistics which are generated from years of observations of various plant species which are most active during early spring. What kinds of parameters are tracked from year to year? Well for plants, that includes when new spring growth appears, when leaves change color, when buds and blooms appear, and when fruit or seed drop occurs. Changes in animal species can be observed as well. Such metrics as when various stages of development of insects (caterpillars, pupae, and butterfly stages, for example) appear, mating behavior, and migrations are all indicators of the change of seasons. These observations are also useful for tracking the migration of pests or invasive species, such as the emerald ash borer. Emerald ash borer forecast through March 26. Courtesy USANPN. 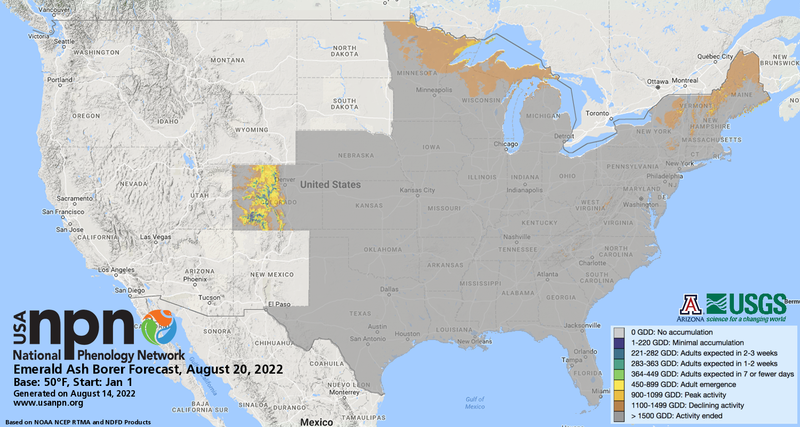 While it might be tempting to just go outside and take advantage of this earlier spring weather, it is also worthwhile to visit the USA National Phenology Network website. There are numerous resources, reports, and information about how you can become an observer and help contribute to this invaluable data source by keeping track of seasonal changes in your own area.